Solution - Technostrobe | Obstruction lights for tall towers in broadcasting, telecommunication, utilities and wind farm industries. Our very new LIDSTM Technology is your solution. Our Lighting Intensity Dimming Solution dims the lighting equipment based on the visibility around the wind farm. 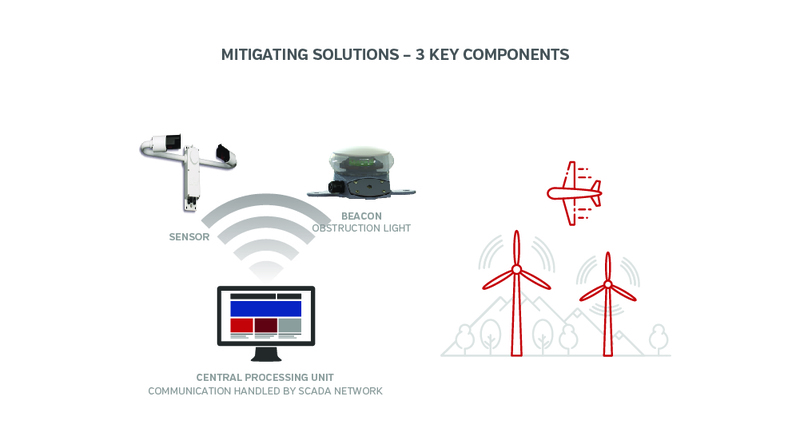 Our solution maintains a safe acquisition distance for pilots, while greatly reducing the intrusiveness of the light to the surrounding community. The community will be able to regain a much more serene environment. LIDSTM offers a safe and low-cost alternative, and it will greatly reduce the nuisance of the lights for surrounding communities. Technostrobe has being measuring visibility on wind farm test sites. The data collected reveals that the intensity of the lights can be effectively and safely adjusted to the surrounding visibility at wind farms. During the trial, the visibility was measured as being greater than 10 km, 83% of the time, thereby allowing the LIDSTM system to dim the lights by 90%. Since clear nights and good visibility are the norm, the intensity of the lights is far too bright most of the time. So, when visibility is good, we just need to dim the lights. Adjusting the intensity level of the lights based on the surrounding visibility significantly mitigates the impact of the beacons on local communities. LIDSTM allows you to dim the lighting equipment based on the visibility surrounding the wind farm. As a result, the community never notices the intensity changes because visibly decreases as the light intensity increases. The science involved in determining visibility with the sensor we are using is called the Forward Scatter Principle. This equipment allows us to make a visibility reading at Point A and extrapolate as to the visibility at Point B (5 km out) and at Point C (10 km out). To ensure consistency and reliability regarding the measurments, many sensors are installed around the wind farm.